I'm one of those who are not too happy about the state of historical romance. I've got a few authors on my autobuy (Courtney Milan, Sherry Thomas, Cecilia Grant, a few old favourites like Connie Brockway and Mary Balogh), but it's been at least a couple of years since I've discovered a new author I could add to my autobuy list. All this year, several of us on twitter have informally agreed to read and review at least one historical a month, but none of the new authors that has spurred me to try have really worked out. Until now. 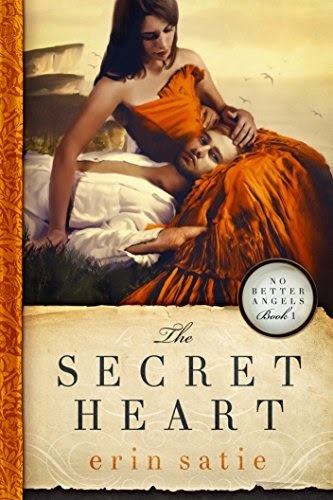 The Secret Heart is exactly the kind of historical romance I have found difficult to find. It features complex and challenging (some might even say 'unlikeable') characters who have passions in their lives outside of their romance, which is something I find lacking in so many books. Caroline Small's passion is ballet. She fell in love with it when her disreputable father installed his ballerina mistress as her governess. Caro doesn't aspire to perform; it's the dancing itself that fulfils her. And to keep her craft at the level she needs it to be, she must practice every day, even when visiting her friend Daphne at her uncle the Duke of Hastings' country estate. It is when returning from her clandestine practice session that she runs into Adam, who's Earl of Bexley and heir to the dukedom. Adam is out in the middle of the night because he was doing something a bit clandestine himself. He boxes. Boxing was quite common amongst gentlemen (if you've read historical romance for any length of time, you'll have read about countless heroes who box at Gentleman Jackson's), but what Adam does is way beyond that. He trains like a proper athlete (to the point of observing a strict diet to keep his weight down) and he fights incognito in meetings frequented by the navvies building the nearby railway. As they start getting to know each other (including sharing what it was they were each doing out at night quite early in the relationship, which I found refreshing) Caro sees her chance. See, her father and two older brothers gamble away any money that comes into the house and are slowly but surely destroying any chance of Caroline being considered respectable and making a good match. Worse, her younger brother's schooling keeps getting put off whenever money runs low. Caro needs to marry well, and she needs to marry soon. Bexley is the perfect candidate. He's well-off, aristocratic, clearly attracted to Caro and Caro is attracted to him. She coolly decides she will target him. And she does. I really enjoyed this. There is a lot to these characters. They have real lives and personalities, and I could understand perfectly how and why they connected as they did. They're not perfect; they have their flaws, and they are self-aware enough to recognise them. I also loved the depth of the writing, especially in the world-building. Where so many historical romance authors just gloss over what they assume is hyper-familiar territory for their readers, Satie really digs in. She clearly has thought about how things would feel and look and smell, and she conveys this perfectly. The book felt incredibly fresh. So what keeps this from an A grade? Well, I felt some of the secondary characters were a bit cartoonishly and unremittingly nasty, particularly (but not exclusively) Adam's cousin and the cousin's step-mother, who are having an affair. It would have been nice at least some of the subtlety Satie used to create her main characters there. Also, for all that I loved the writing and characterisation, some of it occasionally felt a bit self-conscious. It's hard to explain, but at times I could clearly see the author trying to do X, rather than just seeing X. These were the only instances when I was reminded this is a début, and really, there weren't that many of them. Other than that, the book flowed beautifully. If you're looking for something new and different from the usual romances set in Regency-land, I highly recommend this.